There are several mountain restaurants, ideally located, all across the mountain, with a wide range of options for snacks or a 3 course blow-out. At the top of the Bachas chair there is a snack bar and a restaurant. The Flocon has both self-service and table service, and Le Chapka opens for snacks and sandwiches at weekends and peak holiday times. Further down, on the Rochamout piste, is the small, and excellent Peyra Juana. The portions are large, and of an excellent standard. In bad weather get in early though as it is very popular with locasl. At the bottom of the mountain is the Halte du Pré Chabert. Newly rebuilt for winter 2012 with a roaring fire and friendly staff. 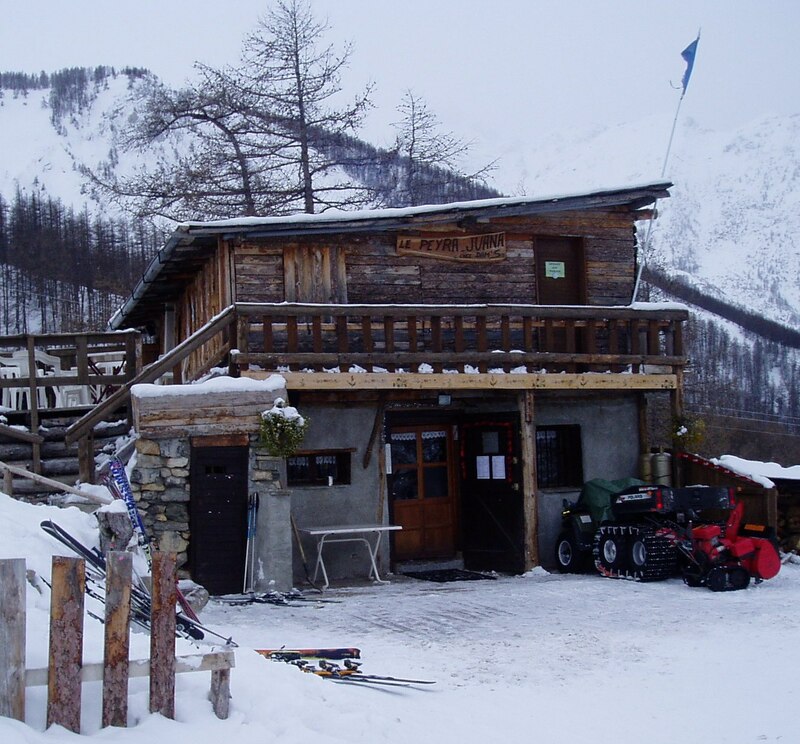 This is the closest restaurant to Chalet Chamoissiere and is ideal to meet non-skiers for lunch. The Plat du Jour is normally excellent. Serre Chevalier After skiing the lovely Cucumelle, you’ll have worked up a thirst, so follow the signs to the Pi-Mai, which has a lovely sunny terrace and enjoy a cold beer. On a snowy day, the hot chocolate and the roaring fire may be more appropriate. From there you can either return via the new Vallons chair, join the rest of the ski are via the Frejus chair and Cretes draglift, or ski all the way down to Villeneuve village. Lunch at the Bivouac du Casse (top of the Casse du Beouf chair) is either good value self-service, or there is a very nice restaurant with fondues etc. Le Bercail at Aravet has a good choice of local dishes, salads, grilled steaks, and good desserts. Ski across to the Chantemerle sector and you are spoilt for choice. The Serre Ratier plateau has three or four restaurants to choose from . The Café Soleil is a very popular, self-service,but you can have a long wait. The Troll hidden around the corner with views of the Stade is our personal favourite, while the Chalet de Serre Ratier had a lovely terrace with views of the Stade du Slalom and nursery slopes. If you venture as far as the Prorel sector above Briancon the Chalet Serre Blanc is small, but cosy, and does great Tartiflette. Ski down towards the town and there is another mountain restaurant at the gondola mid-station with a great value Plat du Jour (apparently around 9-10€). Take the Luc Alphand piste down into Chantemerle village for a long lunch at the Loup Blanc, you may not feel like skiing afterwards though, but you can take the ski bus back to Monetier. There are several restaurants in the village, nearly all of which serve traditional Alpine fondues and raclettes, but usually with additional specialities. Le Kawa is our favourite creperie, and is ideally situated just opposite the Alpen bar. They also do local produce such as Oreilles d’Ane, tourtons de Champsaur and Raviole de Brouquetin. Call in and reserve a table on your way for your aperitif or you may be disappointed. . For pizza, you can try La Brasera, or the former Pizzeria des Neiges, now La Cagette, which also does Provencal style dishes, and fondue. Aquisana next to the hot fountain at the bottom end of the main street has an excellent value ‘menu tentation’ ‘for 25 euros,with home-made gravlax, roast lamb and gorgeous desserts and cheeses. New for 2014 is an Piedmont influenced restaurant La Belotte with traditional Italian cooking which we are looking forward to trying on our next visit in December. You can also reserve a table at several of the hotels for dinner. The Maison Alliey is probably one of the best with a great selection of wines to accompany the local menu. Hi! These are great….I remember the Peyra Juana from our visit, it was excellent. I also really appreciated the tartiflette with smoked salmon rather than bacon that we had at Le Frog (?) at the base of the piste – the decor was nothing special but the food was really nice. Waiting for you now ! We will certainly be along one evening to sampe your new menu. Thank you April, we enjoyed the Maison Alliey too.